The Drakes Bay and Vicinity map area is located in northern California, about 30 km north of San Francisco and about 65 km south of Fort Ross. The map area is in the northern part of the Gulf of the Farallones National Marine Sanctuary, and it includes all or parts of four California Marine Protected Areas. The largely undeveloped onshore part of the map area, which occupies much of the southern and southeastern parts of the Point Reyes peninsula, is used primarily for grazing, as well as recreation, as it is home to the Point Reyes National Seashore. The triangular Point Reyes peninsula, which lies completely west of the San Andreas Fault Zone, is bounded by the steep terrain of Inverness Ridge along its northeastern margin, Tomales Point at its northernmost tip, Point Reyes at its southwesternmost point, and Bolinas at its southern end. The landscape in between includes (from southeast to northwest) the sandy beaches along Drakes Bay, the estuaries of Drakes Estero and Estero de Limantour, and the long, windswept Point Reyes Beach, which is backed by an extensive dune field. The seafloor in the map area generally extends from the shoreline to water depths of about 40 to 50 m, except for the area south of the Point Reyes headland where water depths reach 60 to 70 m. This bathymetric gradient south and west of the Point Reyes headland is related to north-side-up motion along the Point Reyes Fault Zone. Except for the bathymetric gradient across the Point Reyes Fault Zone, the bedrock platform in the nearshore and inner shelf areas (50 to 60 m depth) is relatively flat (less than 1.0°) and is overlain by sand-sized to coarser grained sediment. Finer grained sediments are found in water depths greater than 60 m south of the Point Reyes headland, but they also extend into shallower (less than 40 m) water within Drakes Bay. Surficial and shallow sediments were deposited in the last about 21,000 years during the approximately 125-m sea-level rise that followed the last major lowstand associated with the Last Glacial Maximum, at which time the entire Drakes Bay and Vicinity map area was emergent and the shoreline was about 30 km south and west of the present-day shoreline. Tectonic influences that impact the shelf morphology and geology in the map area are related to local faulting, folding, uplift, and subsidence. Offshore of the Point Reyes headland, granitic basement rocks are offset vertically about 1.4 km along the Point Reyes Fault Zone; this uplift, combined with west-side-up offset on the San Andreas Fault Zone, has resulted in uplift of the Point Reyes peninsula and the adjacent shelf. Late Pleistocene uplift of marine terraces on the southern Point Reyes peninsula suggests active deformation of offshore structures west of the San Andreas Fault Zone. Pervasive stratal thinning within inferred uppermost Pliocene and Pleistocene deposits above the west strand of the Point Reyes Fault Zone suggests Quaternary active shortening of the curvilinear, northeast- to north-dipping Point Reyes Fault Zone. Lack of clear deformation in the uppermost Pleistocene and Holocene deposits suggests that activity along the Point Reyes Fault Zone has ceased or slowed since about 21,000 years ago. Seafloor habitats in the Drakes Bay and Vicinity map area range from unconsolidated continental-shelf sediment to hard substrate. Rocky-shelf outcrops and rubble are considered to be promising potential habitats for rockfish and lingcod, both of which are recreationally and commercially important species. Circulation over the continental shelf in the map area is dominated by the southward-flowing California Current, the eastern limb of the North Pacific Gyre. Associated upwelling brings cool, nutrient-rich waters to the surface, resulting in high biological productivity. The current flow generally is southeastward during the spring and summer; however, during the fall and winter, the otherwise persistent northwest winds are sometimes weak or absent, causing the California Current to move farther offshore and the Davidson Current, a weaker, northward-flowing countercurrent, to become active. Sediment transport in the map area largely is controlled by surface waves and tidal currents in the nearshore and, at depths greater than 20 to 30 m, by tidal and subtidal currents. In the map area, nearshore littoral drift of sand and coarse sediment is to the south, owing to the dominant west-northwest swell direction, and scour from large waves and tidal currents removes and redistributes sediment over large areas of the inner shelf. Tidal currents are particularly strong over the shelf in the map area, and they dominate the current regime in the nearshore. Further offshore, bottom currents generally flow to the northwest, distributing finer grained sediment accordingly. Open-File Report 2015–1068, California State Waters Map Series—Offshore of San Francisco, California, by Guy R. Cochrane and others. The GIS data layers for this map are accessible from “Data Catalog—Drakes Bay and Vicinity, California,” which is part of California State Waters Map Series Data Catalog (Data Series 781). The links below will take you there. Data Catalog—Drakes Bay and Vicinity, California. Each GIS data file is listed with a brief description, a small image, and links to the metadata files and the downloadable data files. Watt, J.T., Dartnell, P., Golden, N.E., Greene, H.G., Erdey, M.D., Cochrane, G.R., Johnson, S.Y., Hartwell, S.R., Kvitek, R.G., Manson, M.W., Endris, C.A., Dieter, B.E., Sliter, R.W., Krigsman, L.M., Lowe, E.N., and Chin, J.L. (J.T. Watt and S.A. Cochran, eds. 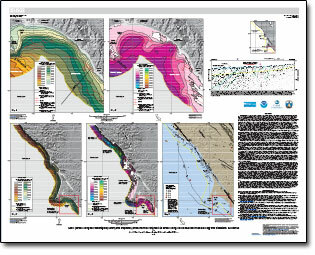 ), 2015, California State Waters Map Series—Drakes Bay and Vicinity, California: U.S. Geological Survey Open-File Report 2015–1041, pamphlet 36 p., 10 sheets, scale 1:24,000, https://dx.doi.org/10.3133/ofr20151041.